The construction of the Norwegian Whaling Station in 1913 constituted a major investment, costing between £20,000 to £30,000, a huge sum in those days. The Norwegian firm behind the venture transported from Norway not only the machinery but also the bricks and timbers required for the construction of the station. The venture was short-lived: the construction began in 1913 and closed down in 1915. See the history section on this website to learn more about what happened and why it failed so quickly. An enlarged section of the only known photograph of the whaling station is shown below. It is hard for present day visitors to comprehend that such a large establishment functioned at this site since there are so few traces of it today. 5 The concrete steps (Obscured by the building containing the boiling vats) leading up to the staff quarters. Three cabins were constructed from imported Norwegian pine to accommodate the crew and factory workers. Each employee had a separate room. A fourth building (the furthest to the right in the photo) provided a kitchen and dining room. The four buildings sat on brick stumps. The boiling vats were housed in a two-storey, wooden building on the eastern side of the flensing deck. Metal buckets were filled with sections of whale-carcass and hauled up to unglazed windows through which the content of the buckets was tipped. The blubber was boiled in open vats whereas the bones and meat were reduced in ‘digesters’ under steam pressure. There is no sign of this equipment. The slipway, constructed from heavy wooden decking, stood on piles and extended into the bay with its lip below sea level at low tide. It was used to haul the whale carcasses up to the flensing deck where they were dismembered. The site of the flensing deck approximates the present day car park at the foot of the road down to the barbeque area. Rubble from the foundations and supports is visible today. The winch house, set further back from the flensing deck, contained steam-driven winches. There is no recognisable remnant of the winch house. A flight of 62 concrete steps, one metre wide, connected the upper and lower levels. 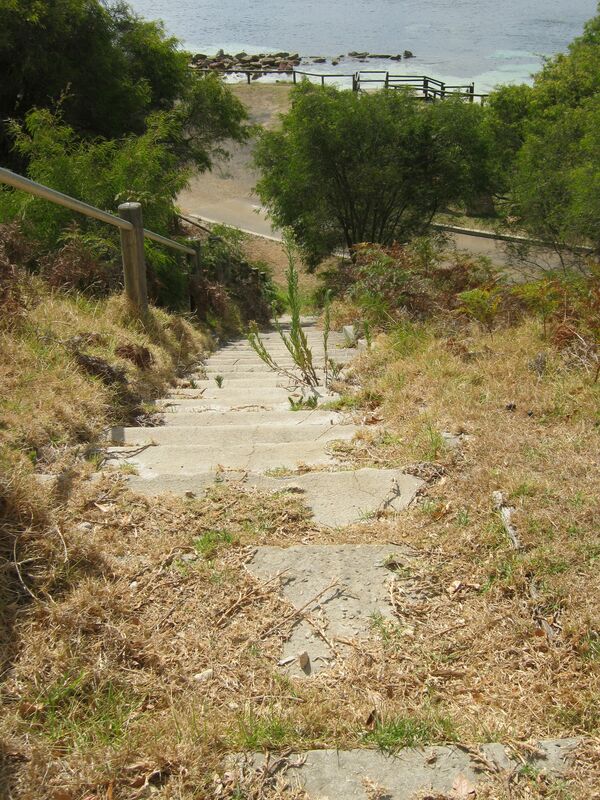 The steps are the best-preserved remnant of the whaling station. Immediately to the west of the flensing deck was a two-story brick building. Its use is unclear though some or all of the building may have been used for repairs or for office work. In a building in this general area was an engineer’s workshop where in addition to repairing equipment, new heads were fitted to the explosive harpoons. Bricks are scattered about the shoreline and sometimes exposed by the tides. Also some bricks have been used to construct seating after the site became a picnic area. Two large storage tanks can be observed in the photograph. It is unclear what they held. The whale oil was shipped in wooden barrels. The oil may have been stored in these tanks as an intermediate stage in the shipping. There are circular footings that may have borne a large tank. This long low shed is visible to the west of the line of buildings and is immediately behind the loading jetty. There is no identifiable remnant. The loading jetty was 200ft in length with a ‘T’ platform at the end on which a derrick was constructed to facilitate loading and unloading. Wooden stumps are sometimes visible at low tide at certain times of the year. A light gauge tramway track ran from the boiler room to the barrel storage shed and out to the end of the loading jetty. There is no vestige of the track. Most likely it was salvaged. Why does so little remain? First, the owners, after deciding to shut down their operation, relocated their activities to Point Cloates on the north-west coast of Western Australia. They took with them the most valuable items of machinery. This may explain why there is little evidence of heavy-duty machinery on the site whereas at Point Cloates many recognisable items of equipment are still visible. Second, a huge storm in 1921 wrecked the slipway and loading jetty and eroded the seawall protecting the foundations of buildings. Buildings toppled and the jetty was no longer usable. Third, after the 1921 storm tenders were called for the salvage of the materials from the derelict site. Timbers and other items were stripped from the buildings and sold off to individual buyers or stored in outer-Albany farm sheds. The salvage operation began in 1922. Finally, and perhaps saddest of all, Albany authorities at the time were unable to recognise any heritage value for the site. 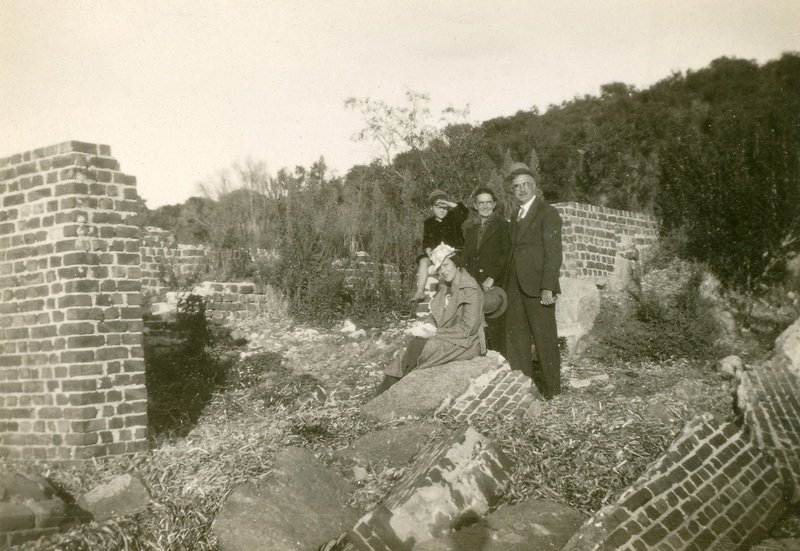 In later years the site was turned into a public picnic area and most of the remaining brickwork, shown in the 1963 photo below, was either used to construct seating or taken to the tip. Today, there is no signage to explain that on the site of the barbeques and parking lot once stood a large and, for its time, modern whaling station. In 1987 a brick pillar 210 cms in height still stood at the site. Presumably it was demolished for reasons of public safety. If you stroll around the present day picnic area, the footings of some of the buildings that once stood on the site can be observed at ground level. All that’s left of the main Norwegian Whaling Station buildings, 2016. It is unclear what these large brick-clad footings supported though together with the concrete steps they are the most intact remains of the whaling station. View of the concrete stairs, 2016. The site of the slipway and flensing deck is in the background. Department of Maritime Archaeology, Norwegian Whaling Station Frenchman Bay: Maritime Heritage Site Inspection Report, No. 82, WA Maritime Museum, 1994. 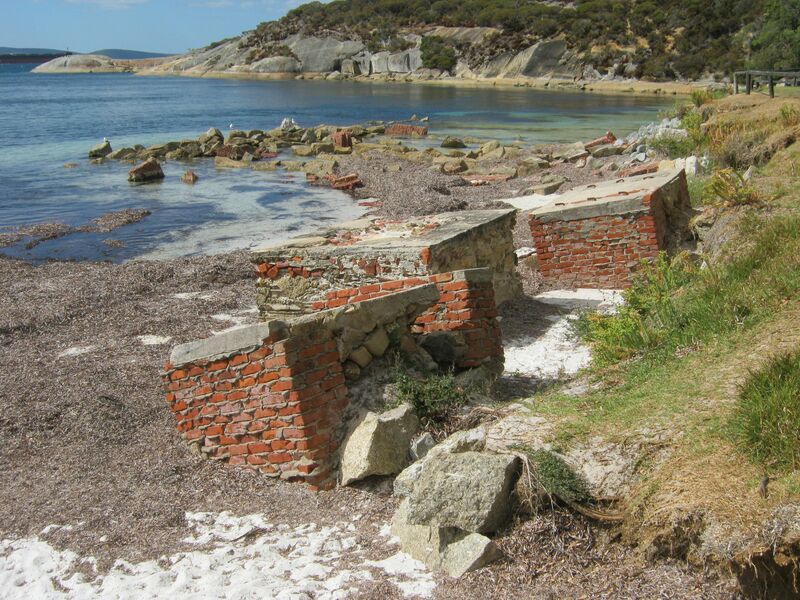 Heritage Council of Western Australia, Register of Heritage Places- Assessment Documentation: Frenchman Bay Whaling Station (ruin), 2008. Gordon Marshall, Maritime Albany Remembered, Tangee Pty Ltd., Kalamunda WA, 2001.